The BNR CL3M Accessory Magnifier Lens Kit for Beam n Read Hands-Free Lights includes 3 large 4x5 inch lightweight acrylic Fresnel magnifier lenses (2X, 4X, 6X) plus a clip-on hinge. The lenses attach to Beam n Read Lights with the clip-on hinge so both light and lens can be directed to the right place for detailed work. The Beam n Read light is worn around the neck so both light and lens remain hands free and can be used Anywhere, Anytime. The combination is especially useful for quilting, knitting, crochet, crafts, hobby work and other tasks where an enlarged view with extra light is helpful. For example, when knitting with dark yarn. The lenses can also be used stand-alone to read small type or see small objects. The magnifier lenses are useful for short periods of detail work for those with normal vision and are not intended as a low vision aid. This kit combined with the BNR LED 3 is similar to the BNR LED 103M. Purchasing this kit for a BNR LED 6-3 or BNR LED 6, which already include the hinged clip and 4X magnifier and features an extra wide light, adds the 2X and 6X Lenses along with giving you an extra clip and a 2nd 4X lens. This kit is compatible with all Beam n Read Hands-Free Lights. 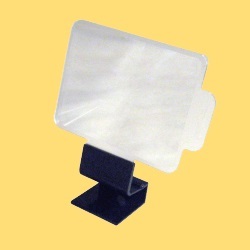 The BNR CL1M Accessory Magnifier Lens for Beam n Read Hands-Free Lights includes 1 large 4x5 inch lightweight acrylic Fresnel 4X magnifier lens plus a clip-on hinge. The lens attaches to Beam n Read Lights with the clip-on hinge so both light and lens can be directed to the right place for detailed work. 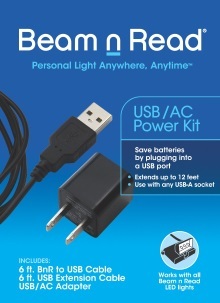 The Beam n Read light is worn around the neck so both light and lens remain hands free and can be used Anywhere, Anytime. The combination is especially useful for quilting, knitting, crochet, crafts, hobby work and other tasks where an enlarged view with extra light is helpful. For example, when knitting with dark yarn. The lens can also be used stand-alone to read small type or see small objects. The magnifier lens is useful for short periods of detail work for those with normal vision and is not intended as a low vision aid. This kit comes in a plain white box and is compatible with all Beam n Read Hands-Free Lights.